Meet your hosts, the safari co-ordinator and the other members of the party at London Heathrow. Fly First Class to Nairobi. Morning arrival in Nairobi. After clearing Customs, board your private plane to fly directly (1½ hours) to Il N’Gwesi Lodge, the award-winning Samburu owned eco-lodge, located in the Ngare Sergoi Rhino Sanctuary and Lewa Wildlife Conservancy. The lodge will be yours exclusively and consists of six en-suite thatched bandas and a dining room, lounge, viewing platform and swimming pool. The Il N’gwesi project won the UNDP 2002 Equator Initiative Award in recognition of their efforts to reduce poverty through the conservation and sustainable use of biodiversity. Profits from the lodge are divided amongst the local community and help to support nearly 500 households, and their schools, cattle dips and water supplies. A guest speaker from Il N’gwesi or Lewa Wildlife Conservancy, will join you one evening and talk about their on-going conservation work. Lunch at the lodge. Afternoon relax in camp. 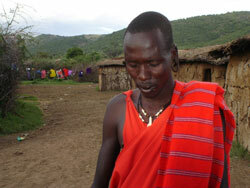 After tea head out with your Maasai safari guides for your first game drive. The area is home to a wide variety of plains game including Grevy’s zebra, reticulated giraffe, gerenuk, leopard, black and white rhino, elephant and the rare sitatunga water antelope. Enjoy sundowners in the bush before returning to the lodge. Time for hot showers before drinks and dinner around the campfire. The rhythm of the bush is very easy to adapt to and conducive to business meetings – just before dawn, tea is brought to your rooms before heading out for an early morning game drive. You’ll have breakfast in the bush before returning to the lodge. The rest of the day is then spent in the relaxing camp atmosphere, which is perfect for board meetings and strategy planning. Your meeting can take place al fresco under the shade of the trees or in a private room. Depending on how your business meetings are progressing either break for a sundowner game drive or to visit the local community to see how the proceeds from the lodge benefit the local Samburu Maasai. Alternatively work through until dinner and enjoy a night game drive, when you may see bushbabies, Spring hare, aardvark, genet cat and leopard, before retiring to your bed. On your final night there is a special farewell dinner in the bush. 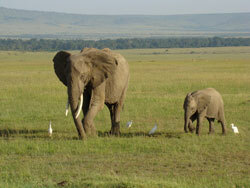 Transfer to the airstrip where your private plane will fly you back to Nairobi (1½ hours) for your homeward flight.